For those who don’t know, Wales is a country within the United Kingdom. It has a population of 3 million people – about the same as Arkansas – and has an area of some 8000 square miles – putting it between Connecticut and New Jersey in terms of size. Cardiff has long been a popular destination for visiting UFOs. In May 1909 ‘scareships’, strange oblong bodies whirring through the sky, were witnessed across the UK. Perhaps the most unusual sighting was that of a Mr C. Lethbridge. Sometime dock worker, sometime Punch and Judy purveyor, Lethbridge was pushing his Punch and Judy cart home via Caerphilly Mountain on Tuesday 16th May. Lethbridge, while admitting he had had a ‘sleever’, maintained that he hadn’t been drunk when he came across the craft and two young men dressed in heavy fur coats and hats. On seeing him the men ‘jumped up and jabbered furiously to each other in a strange lingo – Welsh or something; it was certainly not English.’ They then got into ‘a kind of little carriage suspended from’ the craft, and rose into the air ‘in a zig-zag fashion’. Other witnesses to a strange craft in the sky were a railway signalman named Robert Westlake, the chauffer to Archdeacon Bevan in Brecon, and men working on the SS Arndale. On Wednesday night the airship was sighted in Pontypool by everyone ranging from night shift workers at the town forge, to Mr Garth Fisher, ‘a well known local architect’, and similar sightings came in from Monmouth, Maesteg and even far north, in Aberystwyth. Contemporary explanations included advertising models, super advanced spy ships, and youthful pranks. None was completely satisfactory and by July Lethbridge, as he told the Evening Express, was ‘sick of the whole matter’. More frightening are the rumours of human mutilation cases on Talybont Mountain in the Brecon Beacons. Reporter and UFO enthusiast Derek Gough was allegedly shown photographs of such cases – then received death threats and had his house mysteriously burn down. Gough turned the photographs over to DC Adams of the South Wales Police, who went from promises of an imminent arrest to claiming it had only been a prank. Gough eventually handed all his information over to Richard Hall, who made a NSFW documentary on it HERE. One of the most famous victim of alien abduction in the UK is, arguably, Hilary Porter. First taken at the age of 5, Hilary says that she has been abducted so many times over the years she has now lost count. A stretch of road between Cardiff and Swansea is a particular hotspot; in September 1970 Hilary and her then husband were driving home from Ireland. As they approached the original Severn Crossing they blacked out, coming to to find themselves outside a garage on the outskirts of Cardiff. The petrol gauge hadn’t budged. Hilary believes that aliens are specifically targeting Wales and the rest of the so called ‘Celtic Fringe’ because the genetic make up of its residents is more interesting. She told Wales Online, ‘They are trying to make alien human hybrids and it seems the genetic material of these [Celtic] races are more compatible.’ You can find out more about Hilary HERE and HERE. jang vIDa je due luq. ‘ach ghotvam’e’ QI’yaH devolve qaS. Or, for those of us who don’t read Klingon: ‘The minister will reply in due course. However this is a non-devolved matter.’ That’s what you get for boldly going, eh? The area around the farm was surrounded by hills on all sides, and Mr Williams recalled that circles had been seen there ‘frequently’. As he watched on this occasion, in a matter of ‘only a couple of seconds or so the wheat fell down producing a sharp-edged circle 3 to 4 metres in diameter.’ Some of the earlier circles Mr Williams had seen had stalks still standing in their centres, but this one was completely flat. After 4 or 5 seconds the whirlwind died out completely. This story came to light after Mr Williams wrote a letter to the Sunday Mirror in 1991. Forget the Bermuda Triangle, Wales has its own Broad Haven mystery. On February 4th 1977 a yellow cigar shaped craft is said to have landed in a field next to Broad Haven Primary School, witnessed by 14 pupils – 6 of whom saw a silver man with pointed ears. Frightened by the experience, one of the pupils told his parents that afternoon. 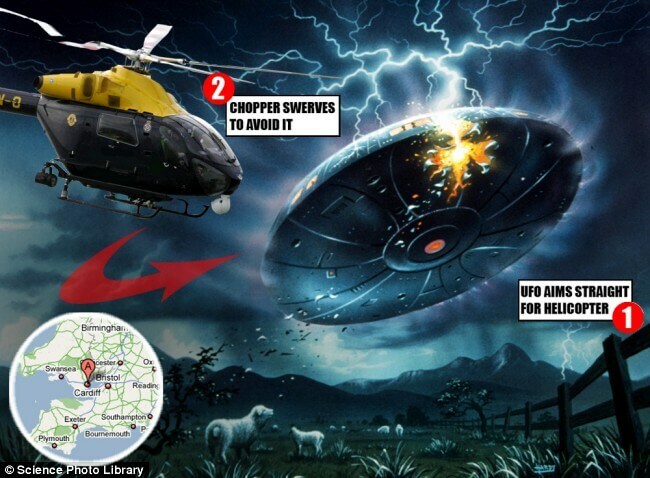 They, in turn, contacted Randall Jones Pugh, a local BUFORA (British UFO Research Association) co-ordinator. The school’s headmaster, Ralph Llewellyn, was convinced by the similarities after asking the boys to draw what they had seen. A few days later dinnerladies and teaching staff also saw a silver craft in the field – and confirmed with the local sewage works that it wasn’t one of their tankers. In the months following the encounter, further strange sightings poured in. In April, Rosa Granville, landlady of the Haven Fort Hotel in Little Haven was woken at 2:30am. From her window she could see what looked like an ‘upside down saucer’ and two ‘faceless humanoid’ creatures with pointed heads. When she went to inspect the area in the light of day, it was to find a patch of flattened grass. At Ripperston Farm the Coombs family were terrorised by aliens, culminating on the evening of April 23rd with a 7ft tall spaceman standing outside their living room window. Even my own mother is convinced she saw a flying saucer land and two bald men emerge while on a caravan holiday in nearby Haverfordwest at around the same time. Because the Berwyn Mountain Incident is Wales’ answer to Roswell: it is often claimed to have been the site of a UFO crash and its subsequent cover up. It’s even suggested that bodies were carried away from the site. A nurse named Pat Evans saw a UFO with flashing lights, but discredited suggestions that she turned back at the order of the military, police, or that she saw any aliens in the 1990s. Some suspect that she was paid to change her story. Some residents recall a large police and military presence – though outsiders maintain they are confusing 1974 with 1982, when a military aircraft crashed into the mountainside. Either way, outside police presence was on the scene very quickly. Veteran UFOlogist Tony Dodd was very interested in the case, and in the 1990s claimed that he had a military source who had seen the humanoid corpses from Berwyn after they had been removed to Porton Down in Wiltshire. His colleagues, said the source, had transported live beings. There is a really comprehensive write up of the case HERE, building on Dodd’s assertions. Whatever the truth of the matter, it doesn’t look like the Berwyn Mountain Incident is going to lose its status as the jewel in the crown of Welsh UFOlogy any time soon!